As is the German automaker's wont, the new 5 Series Sedan comes crammed with technology serving both the driveline and in-cabin creature comforts. Notably, the first shipping iteration of wireless CarPlay is joined by optional assisted driving modes, adaptive cruise control, a heads-up display, and voice and gesture control. "And smartphone integration has been further improved - from Apple CarPlay (which, in a first for a carmaker, has been incorporated fully wirelessly), to inductive phone charging and the WiFi hotspot for up to ten devices," BMW says. 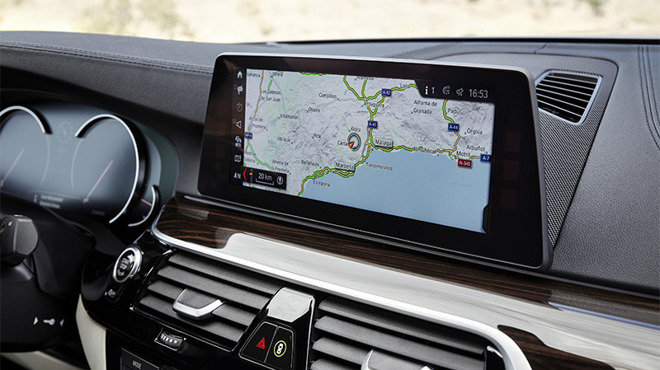 CarPlay links to BMW's iDrive system, which in the 5 Series throws telephone, navigation, entertainment and car function information onto a central 10.25-inch touchscreen. Drivers interact with the system via the iDrive Touch Controller, voice commands, gestures, or direct taps on the screen. While left unmentioned in the press release, it is assumed that CarPlay takes over part or all of the widescreen display when activated. Unlike traditional CarPlay iterations, the version set to debut in next year's 5 Series is completely wireless, meaning users can take advantage of available iOS 10 features without fumbling for a Lightning cable. Alongside wireless CarPlay, buyers can add on options like a Wi-Fi hotspot and a Qi-based inductive phone charger (iPhone users can buy an official BMW wireless charging case for their iPhone 5/5s and 6/6s models). After years of going without, BMW finally jumped on the CarPlay wagon in May when it announced plans to roll out two vehicles with support for Apple's infotainment augmentation. BMW isn't the only automaker looking to integrate wireless CarPlay into its lineup. Volkswagen, for example, was ready to showcase the technology at CES in January, though Apple reportedly nixed those plans. Wireless CarPlay debuted in a beta version of iOS 8 last year, later arriving as an official feature in iOS 9. Like the original wired CarPlay system, Automakers have been slow to adopt the wireless technology.